Rocks' most withstanding veterans rolled into Veterans Stadium this evening unleashing the War Horses for the first of three shows in this city of brotherly love. The boys didn't even know I was coming! I had not planned this trip it just happened, I caught a flight from Atlanta and touched down in time for a fiery sunset over the stadium. Here I am, a veteran of many Stones shows at this show with my father, a veteran Stones fan and veteran of foreign wars. I spent my childhood in this area, I recall going to the Vet for Phillies games in the mid to early 70's. Nearly ten years ago I saw Springsteen next door in the Spectrum, saw No Security at FU Center in 99. This is my third show of the 2002 Licks tour which is only seven shows old after tonight. Believe it or not, I have finally lost count as to how many Stones show I have seen over the years, it is somewhere around 20 - every tour since 81. Philly has always been a strong market for this band. Die hard, long time fans, plenty of radio support. I believe no less than three stations were playing all Stones all day. Pretty late start tonight, when the lights went down the boys fired up Brown Sugar! This is a really hard driving version they are opening with. Mick takes the stage wearing a royale blue jacket. IORR and Start Me Up, the band was pretty hot. The new one, Don't Stop� During Tumbling Dice Jagger flashed his bare chest to the left side audience, reminded me of 81. He also picked up flowers thrown to the stage and carried them to Lisa. Undercover hits pretty hard just before slowing it down for Wild Horses. Nice acoustic number with Keith on backing vocals. Just in front of me was a young 20-something girl reaching back and holding her mothers hand for this one. You know who I am talking about. Very nice. For you Cherry Red, You Can't Always Get What You Want. Dad mentioned to me that I had been raised on this one, I remember it well. Philadelphia did a great job singing! Pretty vocal crowd and I think the band knew it. Ronnie was in the spotlight a bit. Midnight Rambler was really good tonight, Jagger was without the evil hood. It was much like an early 70's version, the video screens showed it with a dated effect, kinda like watching the Gimme Shelter movie. Took us back to that era, Mick of course on harp. For seconds the stage was dark - After the pause the front man appeared again in his white coat and hat for Love Train. This is really coming off well. The crowd enjoys it and sings it like they have been seeing the band do it for 20 years. Richards mumbles a few words and begins Slipping Away, well done, once again taking off his guitar for the first verse or so. "Not looking too good, but I'm feeling pretty well"... Before They Make Me Run. Mick screams three times to intro Sympathy, "pleased to meet you" only lit up one time but it was blinding. The crowd loved this one. The moment we had been waiting for... With much more excitement than previous shows. Tonight we are dead center in front of Mick's mic at the B-stage about 5 people deep! The band comes out to see us and the crowd surges forward. Got a little rough here, in fact I pretty much missed You Got Me Rocking as dad and I had to make a little room, if ya know what I mean. Mick chatted a bit, the band was full of smiles. Let It Bleed followed by Like A Rolling Stone! A great version, harp, sing along, Ronnie jumping around, looking pretty good. Hope you could hear it in Gainesville Charlie! This was really close, only two other times have I been this close to the World's Greatest Rock-n-Roll Band. After the set Jagger took off his shirt and teased the crowd. Surprisingly, he threw it to someone right in front, and jumped back and flashed the biggest open mouth Mick Jagger smile you have ever seen. A classic pose forever etched into my mind. If only I had the camera. Back to the main they went. On this warm evening under a � moon, Keith kicks into Gimme Shelter. Mick begins to appear fatigued, Ronnie and Keith aren't doing much to help him entertain the crowd either. Lisa helps with vocals. The X rated video for Honky Tonk is still unedited. Great version of Street Fighting Man and Jumping Jack Flash seems to get a second wind. For the encore, rounding out the War Horses is of course Satisfaction. Thundering fireworks illuminate this Southern Philly sky. This show ranks pretty high with me based on being so close to the B. However I gotta say Sir Michael's voice is amazing and he still swaggers across the stage like no other. The band is really tight, really nailing these early shows. Charlie was good tonight wasn't he? Mick also did a lot of the "are you feeling good," "you want some more," "oh," "say yeah!" Obviously these parts are much better heard than read from here! It was a nice change of plans that got me here, a pleasure to visit but I can't stay, gotta catch a flight in about six hours. By the way, if you are catching the Stones in a multi-show city, it looks like they will have special edition shirts for these cities, they had them in Boston and now Philly too. The band has two more shows at this stop. I just got back from the Vet show and thought I would contribute a review. This was my 11th stones show. The pretenders were incoherent and got on my nerves. Only two songs I'll Stand By You and Back On the Chain Gang were acceptable. Despite my critiscims, I had a blast , i think 9:42 is too late to go on during the workweek however, esepcially after sitting through the Pretenders, who were pretending to be something like a rock band! Don't stop seems to get better and better. Rambler was really awsome!! Mick's harmonica and Keith's guitar is like a marriage with no end. Then there was Wild Horses: full of emotions, great voice, great slow beat, great snare picking, great song! Too bad they did Like A Rolling Stone on the small stage, but to make make it up for real fans, they did Let It Bleed. After the show there was a VIP party for those who bougt the packagedeal. But there were no VIP's at all. Just fans who paid about 1.800 dollars to get tix for 3 shows. Far too much I think, but on the other hand, my only possibility to get the Tower ticket. So we all just rock on to the Philly arena and then the theatre gig. And rocking on with the Stones is like a religion, just do it and don't care about the money, wich is temporary. Memories are forever!!! By the way: just met Ronnie on the streets of Philly. Great show at the Vererans Stadium last night, I'm still rockin' from it. Feeels Sooo Gooood! The Stones opened with Brown Sugar, (I wish they would open sometimes with RIP THIS JOINT). But BS started the show off nicely, START ME UP was rockin' too! . DON'T STOP, it seems, is becoming everyones favorite. I guess the boys will add the other new releases to the setlists after the album is out! Can't wait to hear those. TUMBLIN' DICE was real early in the set and is always a favorite. MIDNIGHT RAMBLER is great for the stadiums, but it fits anywhere, it really kicked last night tho. Mick out did himself on LOVE TRAIN, the white coat is a good choice for this number. Keith really did lovely versions of SLIPPIN' AWAY and BEFORE THEY MAKE ME RUN, ( a fav, always with the fans). SFTD, Mick is at his finest. GIMME SHELTER and Lisa, wonderful as usual. SFM, Keith ripped this one. My all time fav, JUMPIN' JACK FLASH (encore) and (I Can't Get No) SATISFACTION, (encore) had the crowd loud and wanting more. Backups great, Lisa, Bernard, Blondie, Darryl, Chuck and the horns outstanding. Crew, thanks for doing yer good job too. THANKYAVERMUCH STONES! Thanks to all! The show, in one word: "SWEET"! But that's all folks, see yas at the FUC! I have seen the Stones perhaps 10 times since 1989. This time they literally blew me away. The biggest difference was Mick's voice -- it was AMAZING. I had been minorly annoyed in some of his past shows where he just yells or almost talks instead of singing but his voice is as strong as ever and sounded incredible. The entire band sounded great, especially Charlie. Keith's solo songs were the best I have seen (although he made some mistakes, his voice was soo strong and smooth and cool!) He messed up the ending though by singing at the wrong time, and just kept on going. He also hit the wrong first note on the opening chord to Brown Sugar to start the show!! OUCH!! But that was all soon forgotten. They played a number I had never heard before, but the entire crowd around me seemed to know it: "Love Train" -- I'm probably showing my age on this one! I must say that the video screens literally blew me away!! They have an amazing system that is beyond ANYTHING I have ever seen before. The screen is so big, it's hard to describe it. Just to give you an idea, I have a pic of Keith on the screen, and Keith on the stage is barely seen as a small smudgy dot. And this was from the field! 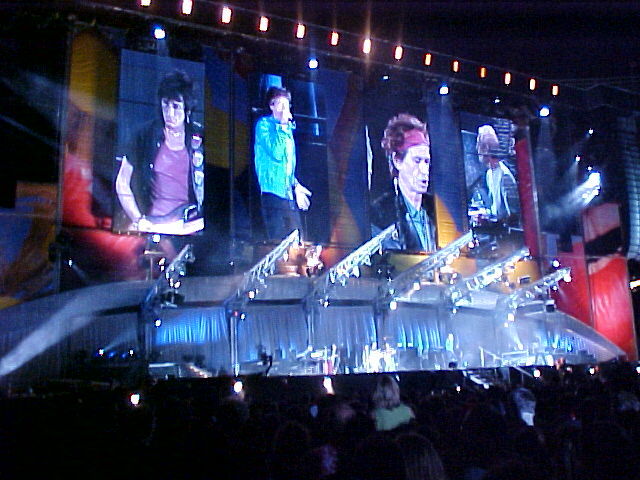 The screen was enormous, and there is one part where they separate it and have a camera following each of the four guys. THAT was AWESOME!! (There is a pic of that that someone else took on this review page) I certainly hope they include that feature on a DVD release (multiple camera angles so you can view whichever member you want at any time). Security seemed rather lax, as the guy behind me had a full digital camera with zoon lens. Unfortunately I did not tape it but I did get some photos from the walkway which turned out great. These boys are so hot and the crowd was AWESOME. Another thing that has bothered me in the past is the lazy audience of old farts but this night they were EXCITED! Bottom line: This show was THE BEST I have seen the Stones in 15 years. I am not exaggerating. See them. As many times as you can. You will not regret it. Thanks to beachbum13/Andy for great photos! Thanks to Gerardo Liedo and Barry M. for links information!